As I think most of you know, I participate in a monthly bundt baking group, and every month we're challenged to use a different theme or ingredient by our group founders, Anuradha of Baker Street and Lora of Cake Duchess. May's theme was berries and I knew immediately that I would use my two favorites - blueberries and strawberries. Now that the weather is finally warming up, we're seeing some beautiful fruit at the market and I knew they would make a moist cake. But I also wanted something a bit more special. If you're a regular reader than you know that I love me some streusel. But it's hard to get a good crumb topping on a bundt cake because bundts, essentially, bake upside down. So, if I can't have the crumb on top, I'll just having it running through the cake. The result was a very tender cake with sweet fruit in every bite and a tasty surprise when you bit into the streusel. Brian definitely listed this as one of his favorites so far. Enjoy! Preheat the oven to 350 degrees and butter and flour a 12 cup bundt pan. To make the streusel, mix together the flour, sugar, salt and cinnamon. Cut in the butter with a pastry cutter or fork until clumps form. Cover and refrigerate while you prepare the batter. In a bowl, combine the flour, baking powder, baking soda and salt. In a separate bowl, beat together the butter, sugar, eggs and vanilla. When that has been creamed, add in the sour cream and lemon zest and beat until combined. Working in batches, add in the flour mixture until everything is combined. Gently fold in the berries. To assemble the cake, pour half the batter into the pan, spoon in the streusel and finish with the remaining batter. Bake for 55 - 60 minutes or until a cake tester comes out clean. Allow the cake to cool thoroughly before turning it out of the pan and dust the top with powdered sugar. Makes approximately 10 servings. Wow! Streusel + berries = breakfast food, right? Crumb running throughout the cake is a brilliant idea. I knew I liked you :) This is a beautiful cake, Anita. That looks amazing Anita! I love anything that is baked with a lot of fruit, I think it is delicious! 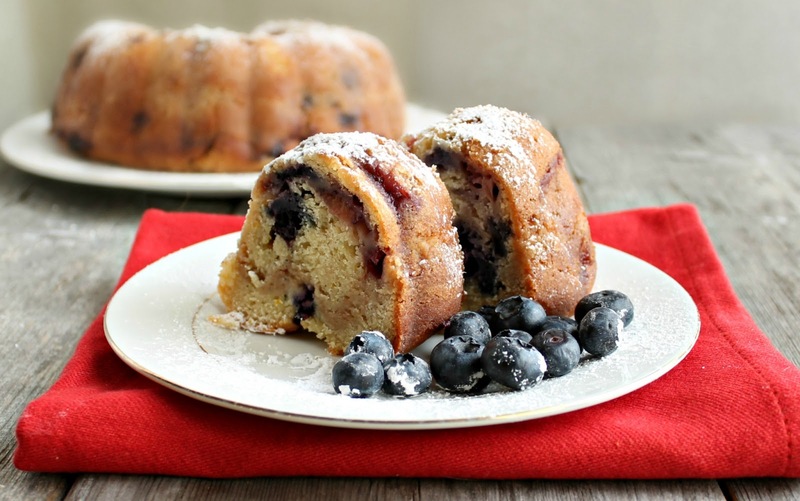 Your bundt looks super fruity and super yummy! Fabulous idea to have the streusel going through the middle of the cake. I would probably eat the top and bottom and save that part for last because I love, love, love streusel so much. Anita, this looks fabulous! It would be equally good first thing in the morning with a cup of coffee or for dessert at night. This combines two of my favorite things, bundt cakes and streusel! Just need some coffee! A cake with streusel makes my day, but with berries added is even better Anita! And using it in the middle is the way to go. 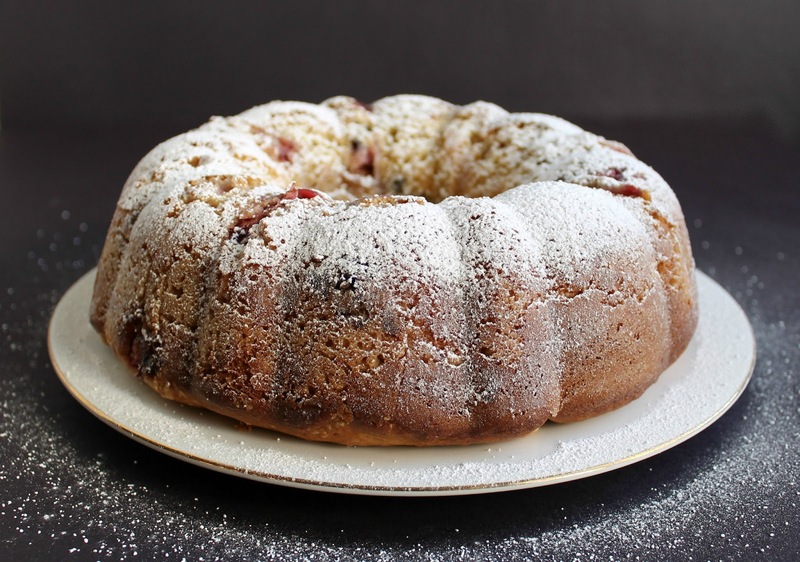 The streusel topping on your Bundt sounds amazing! I love crunchy toppings on my sweets! Starbucks has a coffee cake kind of similar to this. I cant wait to try your version. This bundt is absolutely gorgeous!! I love that you used two kinds of berries, notes of lemon and that streusel... well, I'm a sucker for anything with streusel involved. Yum! Yum yum yum! I love tossing berries into my baking and streusel topping makes everything better! 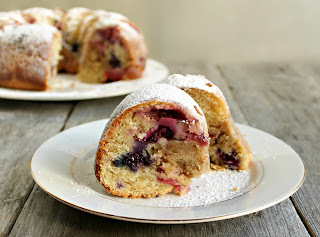 I love the streusel + all the berries in your bundt. . it really looks delicious! Can't wait for next month when we all get to attempt swirls! Looks beautiful! I'm so glad berries are back - and you did a great job with them! Perfect theme for May! I love berries and have been eating them nonstop lately. Of course I would love to slice in to a piece of your bundt. I am going to try this recipe as it sound very good and with it being a bundt cake it will be easy to keep for two people. Thanks for sharing. I could eat this Bundt for breakfast or serve it as a dessert-- looks great for any time of day. Great choice of berries! This looks wonderful. Thanks for sharing on Foodie friends Friday. Lovely Anita thanks for sharing at Foodie Friends Friday! I bet this is one super moist cake. Did you save me a slice? YUM. I love streusel, blueberries and strawberries. Perfection! What a tasty sounding bundt cake. I like that you have a streusel included.